Myth #2: A bishop or a pastor can tell the assistant priest (or parochial vicar) that he is following too many of the Church’s rules at his personal or public Mass. Truth: The priest is responsible for offering his own Mass worthily and well. In every pre-Vatican II Missal (probably going back 1,000 years or more) there are rubrics listed; any purposeful diversion from these imputes immediate mortal sin to the priest (not his bishop.) No one has proven to me that this has been abrogated doctrinally in the past 50 years. The priest is the extension of the bishop’s hand in the diocese, but he should be willing to lose his faculties before going against the tradition of the Church. The bishop is the chief liturgist of the diocese, but even documents after Vatican II like Redemptionis Sacramentum (2004) give astounding power to the individual priest to follow the rules of the Roman Mass outlined in that document. If he has faculties, he needs no one’s permission to follow these rubrics. This includes protection of the Eucharist: For people in sin who come to Holy Communion, the priest should never embarrass the person at the altar-rail. Rather, he should pastorally try to convince them of life-reform behind close doors. Should the communicant ignore the priest, and should the communicant be in public sin, the priest is then allowed to refuse them Holy Communion. In the next year, we will see cases of bishops denying priests this right, but the Vatican ruled in a 2000 document that “no ecclesiastical authority may dispense the minister of Holy Communion from this obligation in any case, nor may he emanate directives that contradict it.” No ecclesiastical authority includes the Pope, since we’re talking about a matter of Divine Law that a man can not change. Nevertheless, I predict that more cases (like this one that happened even before Amoris Laetitia) will catch priests and bishops into similar Eucharistic and doctrinal divisions that many predict could cause schism in Rome. But first, I predict this story will first play out in the United States between bishops and probably more “neo-con” priests than even “trads,” based on simple demographics of who attends the Traditional Latin Mass. Myth #3: A priest can be defrocked. —Laicization: This is a process whereby a priest asks for dispensation from his vows, usually in order to get married. Ultimately, only the Pope can give it, even if by rubber-stamping. But the paperwork still goes through Rome, even in these times of odd decentralization. Truth: We love the fact that you love Christ in the Blessed Sacrament more than us, but when you talk like that, it’s obvious you have a love of the Eucharist without a love of the priesthood. Here’s what I mean. The priesthood actually includes 3 munera or gifts: 1) Teach. 2) Sanctify (sacraments). 3) Govern. Most neo-cons and even many traditionalists want their priests to give them the sacraments their way (à la Burger King) and then to not ruffle their feathers with too much besides that. Well, we’re not sacramental ATMs. You don’t get the sacraments without us also teaching and governing. If you just want the Eucharist alone, go to a Communion Service. 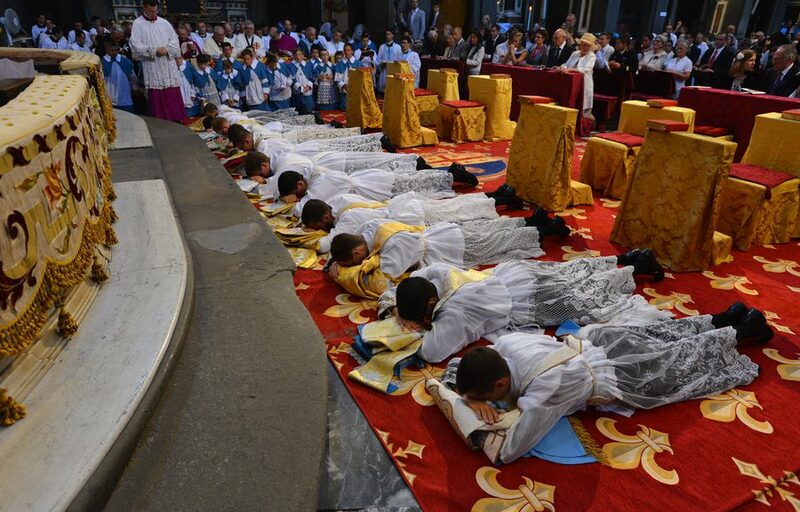 If you want to live the Holy Sacrifice and experience fatherhood in the future life of the Catholic Church, then raise chaste sons to become heroic, manly, loving, sacrificial priests who are at one and the same time both servants and leaders—and of course, great teachers. Then, the people will follow men who are not only experts of the sacraments, but experts on the human heart. Myth #5: It is a good idea for a priest to pray his Psalms. Myth #6: Priests are the least safe people to have around your children. Truth: Priests are statistically the safest people to have around your children. Before getting into statistics, let me apologize on behalf of the Catholic Church for the thousands of priests who abused children and subsequently caused unknown numbers of Catholic families to leave the Church. I believe all those priests should go to prison for life. If they do not repent and confess in prison, they will burn in hell forever. There is no excuse for bishops who moved priests around. They shouldn’t retire in Rome. They should go to prison, too. You will hear no justification from me for this behavior, so I don’t expect the following statistics to heal the families who had someone commit suicide after being abused by a highly-trusted priest. But, we must also consider two things that the media is not telling us. First, pastors, priests and rabbis have the lowest rates of abuse of children. Teachers, doctors and farmers have the highest rates of harming children. Religious leaders are simply the safest. Among religious leaders, priests are statistically the safest. Non-Catholic Philip Jenkins at University of Pennsylvania has shown here that statistically, the rate of molestors among priests is 1.8%, lower than any other “profession.” Do you want to know who is the most dangerous people around your children? Male family members. Priestly celibacy is not the issue, especially since married men are statistically more likely to abuse children than unmarried. Most child abuse takes place within the home. The second issue that the media is silent about is the fact that 80% of the priests who molest children are homosexual. Even the USCCB was—at one point—transparent on this. Regarding the John Jay study, Dr. Paul McHugh, former psychiatrist-in-chief at Johns Hopkins Hospital and a member of the National Review Board, said here that the priest crisis revealed a “homosexual predation on American Catholic youth.” This is not shifting the blame. It’s simply showing us that celibacy is clearly not the problem, especially since celibacy automatically requires the highest levels of self control. I say to people all the time: “If you marry a pervert, you have a married pervert. If you ordain a pervert, you have a priestly pervert.” The real question is not married priests. The real question is why the bishops in the 1970s and 1980s filled their seminaries with homosexual men. But you probably won’t hear much about that in the Boston Globe. Myth #7: A priest can live without a woman in his life. Truth: A priest can not live without a woman in his life. That is why we have the strongest devotion to the Blessed Virgin Mary. I have never known a priest who prays five decades a day to fall into preaching doctrinal error. Anyone (of any vocation) who prays 15 decades a day is nearly invincible against chastity falls. And yes, you can quote me on that. It’s not that God is counting how many prayers we pray. Rather, the tighter we are wrapped in the veil of the Immaculate Heart, the more shielded we will be from the missiles of the enemy that take down priests every day. Oremus pro invicem, let us pray for one another.